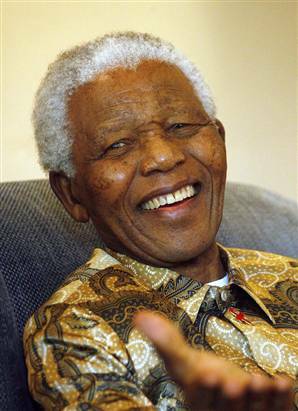 Nelson Mandela turns 94 today. And what an extraordinary 94 years this man has lived! Few people in the world inspire me more. Clearly, millions of others feel the same as I do, as people from all across the globe are celebrating Mandela’s remarkable life by taking part in Mandela Day. 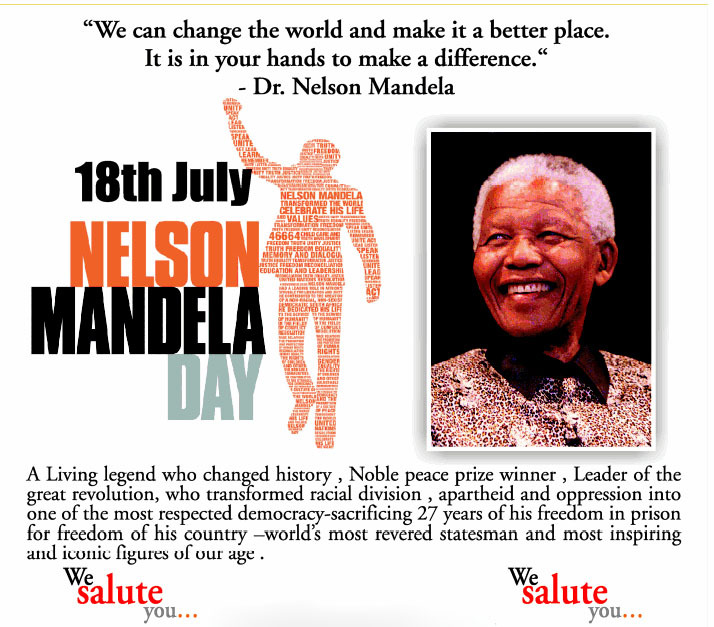 I encourage you to take part in Mandela Day too. Click here to read 67 Ways to Change the World. I think you’ll be surprised by how easy it is to make a difference. How do I plan to make a difference today? By doing three simple things: 1) Sharing this idea and hopefully inspiring others to do the same, 2) Delivering meals to homeless people here in Santa Barbara, and 3) Donating art supplies and clothing for a project my friend, Lori Robinson, is supporting in Africa. You might remember my post about Lori entitled, Africa’s Beautiful Bag Lady. Not only is she still working on trying to eliminate plastic bags in Tanzania, but she’s helping with a project called Dancing Hope. This project’s goal is to help children in one of the largest slums in Africa by giving them the gift of art and music. Click here to learn more. I can think of no better way to kick off this day than to post a rousing version of “Free Nelson Mandela.” This 1984 protest song, railing against apartheid and Mandela’s imprisonment, will forever be etched in my memory, and take me back to the days of dancing on the lawn at Lewis & Clark College, where a small, but boisterous group of student protesters built a shantytown, symbolic of the conditions for black people in South Africa, demanding our school divest. It’s an indelible reminder of what is possible when the world comes together in all its different ways to create change. This version was sung by the late Amy Winehouse during the 2008 “46664 Concert” in London. 46664 concerts are a series of AIDS charity events played in honor of Nelson Mandela by South African musicians. Mandela was imprisoned on Robben Island in 1964, and was the 466th prisoner to arrive that year. How has Nelson Mandela inspired you? 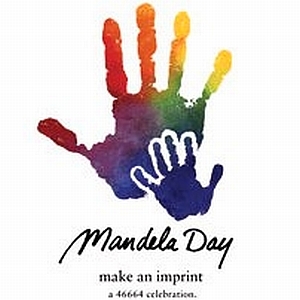 Will you be participating in Nelson Mandela Day? If so, how do you plan to make a difference (big or small)? One way you can take part is by sharing this post so others can be made aware of this special day and the numerous ways to get involved. PS: Check back tomorrow and read about what it was like for Jeffrey to be at the frontline of history, photographing Nelson Mandela when he became South Africa’s first black president in 350 years. This entry was posted in Gratitude, Random Musings and tagged 94, Becky Green Aaronson, birthday, Free Nelson Mandela song, inspiration, Nelson Mandela, Nelson Mandela Day, Nelson Mandela quotes, South Africa by Becky Green Aaronson. Bookmark the permalink. Wonderful tribute to Nelson Mandela. He is a true hero. The quote of him which you shared says it all about the personality of this great man. The message he tried to spread was so simple. What I learn from reading about him is that- “It’s very easy to hate someone but it’s rather easier to love others. ” Great post Becky. I’m glad you liked this post, Arindam. It’s an honor to pay tribute to such an inspiring person. I love that Mandela quote on love and hate – I am posting it everywhere! I love that quote too. Post away! Truly one of humanity’s greats. Being South African I know firsthand the prevailing mindset of those times and what a miracle he pulled. Happy, happy birthday dear man! Rossandra, thanks for sharing your South African perspective. Mandela is definitely one of humanity’s greats! Such an inspiring post! You always make me want to do better in the world, Becky! I remember watching TV, waiting for Mandela to be released from prison. I don’t think I fully grasped the significance at the time. It’s hard not be inspired by Nelson Mandela and the example he has set for all of us. What I loved about reading 67 Ways to Change the World is how easy it is to make a small difference. It’s all of our small differences that add up to making a big change. I really liked reading about Mandela Day. I am an adult literacy tutor at the Library and I go tutor today and that seems to fit with Mandela Day. I’m also a volunteer with hospice of SB. It was really interesting reading more about Nelson Mandela. I loved the first quotation on the page that you used. What a wonderful tribute to Nelson Mandela. I remember protesting against apartheid when I was in college, and when Mandela was finally released from prison, I felt such elation! Although we still have such a long way to go, remembering what Mandela sacrificed for South Africa (and the rest of the world) gives me hope as I look toward the future and imagine the positive changes that will undoubtedly come with time. I remember the day he was released from prison well. I got up at some insane hour in the morning to watch it on TV. There was a lot of waiting as they dealt with the logistics of trying to figure out how to keep control of a highly-emotional crowd. The utter joy and relief I felt thousands of miles away, when he finally appeared, came out in a flood of tears. It almost didn’t seem real that after twenty-seven years, he was standing there pumping his fists in the air, finally a free man. Most people don’t know that the work and negotiations that lead up to Mandela’s release, and later his inauguration as president, began nearly a decade before he was let out of prison. It’s truly a miracle, and a testament to the human spirit that all of this came to fruition. After being held in jail for twenty five years, the most inspiring thing to me is that Mandela did not come out bitter and angry and fighting. He continued on with what he believed in, never wavering with negativity. That is truly the amazing part of this story to me. When one is focused it seems nothing will get in the way. It’s hard to imagine possessing such grace after all he went through, but that is the beauty of Nelson Mandela. Without him, South Africa, and the rest of the world, would be a much different place. Your work in Africa deserves mention. I hope others will swing by your blog and see what you are up to this time. I must say I never thought I’d hear Amy Winehouse singing a song for Nelson Mandela! Becky your blog is a constant source of inspiration for us. We must never forget heroes like Nelson Mandela. When we were in Cape Town last year we visited Robbin Island and the saw the jail cell where he “lived” for 25 years. I do remember your post about Lori Robinson entitled, Africa’s Beautiful Bag Lady. I found you and your blog through that post because my blogging buddy Melissa linked to it. Nor did I (re: Amy Winehouse). But contributions come in all shapes, sizes, voices and personalities. That song, whomever sings it, with its upbeat South African musical influences, perfectly captures Mandela’s spirit of staying optimistic and moving past hatred. It will always remind me of what is possible. I’m glad you find nuggets of inspiration on my blog. Your comment makes blogging all worthwhile. And I must smile at your “small world” moment in SB last weekend! It never ceases to amaze me how connected we are. Becky, you are a continual affirmation of why I can never become a cynical person. To have lived through a time when South Africa was turned on its head — and to be reminded of its embodiment — indeed takes some of the edge off political (un)realities in our world. I love the ’67 ways . . . ‘ Just think of the geometric progression if we each take just one to heart. Nelson Mandela is the perfect reminder of why optimism and determination will always win out over cynicism. That’s why, when I was 23 years old, I scraped together every penny I could earn and flew to South Africa. Mandela had just been released from prison, and after writing a senior paper about censorship and apartheid in college and immersing myself in the history of this complicated and beautiful country, I felt compelled to put my feet on the ground. The experience of being in Soweto and other parts of SA, and witnessing apartheid first-hand is something that has never left me. Seeing how Mandela overcame it all to become South Africa’s first black president and lead his country in a new direction…there aren’t enough words to express my awe and joy. I did not even know about Nelson Mandela day. Thanks for sharing this! It’s a day to celebrate, for sure. I’m glad you stopped by my blog today so you could hear about it. It’s always great to see you here, but especially fun when I get to share something near and dear to my heart with somebody I admire. Dancing with Gratitude for Nelson Mandela | The Art of an Improbable Life on Happy 95th Birthday Nelson Mandela!